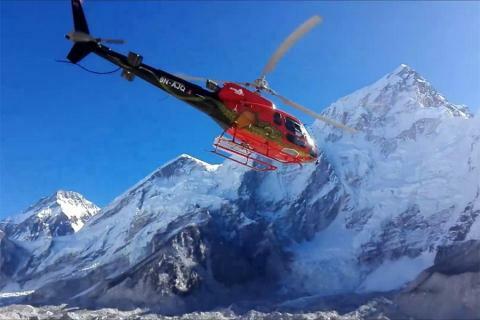 Everest Region Helicharter: You can book helicopter charter service for Kathmandu to Lukla and other everest region like kala patthar, Everest base camp,Namche Bazaar etc on your desire.Everest region is recognized as one of the most popular place in this planet. This region is famous for trekking around Everest base camp, Gateway for Everest summit, scenic Everest region heli tour etc. You can use Kathmandu Lukla Heli charter services for different purposes like scenic Everest Heli tour, for the purpose of rescue, means of air transportation etc. Budget: Please ask us ! we provide you best value !! Everest Bease camp Heli breakfast tour might be a one of the best scenic tour for kingdom of Himalayas which allows you touching your feet on the elevation of Earth 16000 feet (5,000 meters approx), taking breakfast at an height 12,340 feet (3761 meters) and 3 hours continuous fly to world of Himalayas where you can see nothing beside shiny peaks of mountain, there precious glacier, Himalayan geographical structure and many more regarding Himalayas. Our company representative picks you from hotel at an earlier morning and drive to Helipad in Tribhuwan International Airport. Now our pilot is ready to take off and directed towards North West following the series of Mountain on the left side and long ranged hillside with village and river on the right side. From beginning lunar view of Mountain starts from Ganesh Himal( which can be seen from Kathmandu also), Langtang range( Popular trekking route in Nepal bearing Tamang Heritage on the lap), Shisha Panga ( 8,014 meter), Dorje Lakpa(6970 meters, hundreds number of Sherpa’s prefer their name from this Mountain Name ),beautiful Phurbi Gyachhu, Choba Bhama ree ( 5934 Meter), Gaurishanker( worship as God Mountain by Hindus ), Mt Melungtse (7024 meter), Numbur( 6955 meter, Mother peak of Sherpa ), Karyoluong( 6512 meter) , Mt Choyou (8201 meter, 7th highest peak in the world and famous for expedition also). During this period of time our Pilot will point you the peak of Mountain along with its name and short briefing. After crossing this mountain range now we are very close to Words highest peak Mt Everest along with other Mountain Nuptse(7856 meter ) and pumari (7162 ) on its nearby. Our Effort will remain for instant helicopter charter service. In the case of high season and high demand of Helicopter It may takes further time for helicopter availability cause of limited number of helicopter in Nepal. Sometime because of bad weather and low visibility operating flight may not be possible. There might be additional charge if the flight duration will be extended because of various region. Flight cancellation by customer should be made before 48 hour. 100 dollar cancellation charge will be charged. No cancellation and postpone charge will be charged if the flight will be cancelled because of various technical problem or weather problem. Fifty percent of amount should be paid on the time of Heli charter conformation and remaining amount should be cleared before Helicopter flight. All the decision of operation helicopter will be reserved by Pilot and Helicopter company. Why to book with Us ! -Response of your inquiry by email or phone will be made within 1 hour. For major destination you will get cost instantly. -Price provided by us is as per government and Heli charter company rules. No extra charges will be included. -We have moderate cancellation, date change or location change policy. -We are using Google maps for providing you exact cost based on aeronautical distance and elevation of landing place.